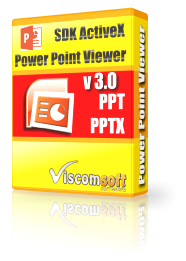 For Windows Developers who need play the PowerPoint presentation without installed MS PowerPoint. Support display PPT, PPTX, PPS file without installed MS PowerPoint. Custom define the size of PowerPoint Windows. 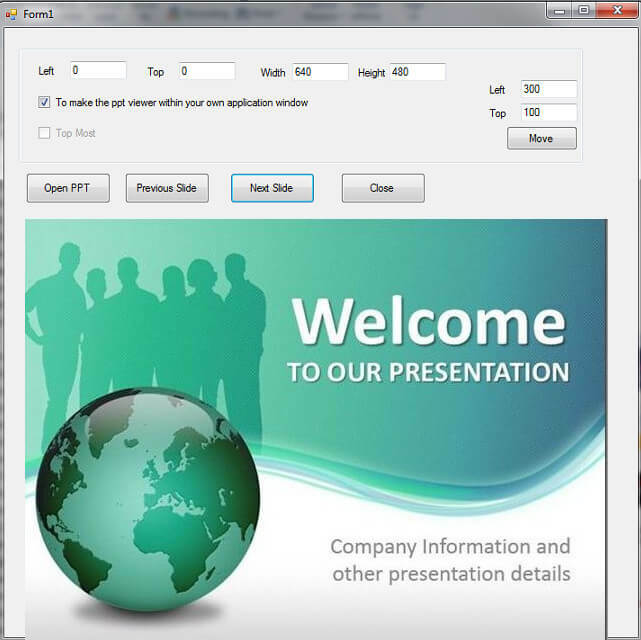 Display PowerPoint with On Top Most Windows or On Top Window. Support Display PowerPoint within your own application window. Support get the total number of slides and current slide number. Support control the slide forward or backward. Checking the computer whether installed MS PowerPoint Viewer. Include VB.NET 2015, VB.NET 2010, VB6 , C# 2015, C# 2010, Delphi, Visual Foxpro Sample source code. added get the total number of slides and current slide number. updated VB.NET 2015, VB.NET 2010, VB6 , C# 2015, C# 2010, Visual Foxpro samples. redesign the engine, now it can display PowerPoint without installed MS Office. Just need installed MS Free PowerPoint Viewer. added VB.NET 2015, VB.NET 2010, VB6 , C# 2015, C# 2010, Delphi, Visual Foxpro samples.